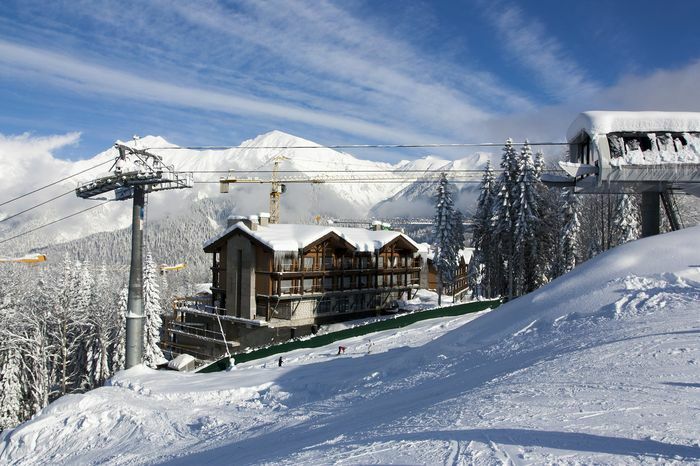 Krasnaya Polyana is a magnificent resort near the city of Sochi, combining fresh mountain air and warm climate. Many people became interested in this place after the Sochi Olympics. Today Krasnaya Polyana is a unique resort with many attractions and exhibition complexes. Do not be surprised if you meet people with large backpacks here — the village has many tourist routes. In winter, you can conquer the mountain peaks, skiing and snowboarding, and in the summer you can visit museums and admire the picturesque Sochi nature. The interesting sights of Krasnaya Polyana will be described below. What to see in the summer? Want to know more interesting facts about this village? Welcome to the Museum of the History of Krasnaya Polyana, founded by Boris Tskomariya, an honorary local historian of the city of Sochi. Today, the institution has more than 15 thousand exhibits, most of which are originals of ancient things. Here you can see military tools, household items, all kinds of maps. In addition to the exhibition halls, it has equipped classrooms for school trips. Anyone can visit this museum, and for free. An interesting water feature with the sonorous name «Maiden Tears» is one of the main attractions of the resort. It is known that in the Caucasus they love various legends and beliefs, so the waterfall also has its own history. A long time ago, a family lived in these places with a beautiful daughter, whose beauty delighted and fascinated everyone around. But the evil witch, envying the girl, bewitched her and ordered her to be thrown off the mountain, if she did not forget her lover. The girl refused to do it, and the villain is still no peace, because the beautiful tears flow down the slope for more than a thousand years. Have you long wanted to find a soul mate or want to meet a future lover? You definitely need to go to the waterfall, because, according to legend, an unmarried girl who washed her with clean water will soon find her chosen one. The place called “Little Switzerland” is famous for its lake valley with the melodious name Dzitaku. Staying in the clear mountain air will help you to improve your health, and beautiful landscapes and amazing views will fill you with energy and relieve stress. The best time to visit the valley is summer and the first half of autumn. It is then that you will be able to fully enjoy the beauty of the Seven Lakes — the snow will come down from the mountain peaks, and the water will become clear and transparent. On the way to the valley, the Chugush trail and the Bzerpa Mountains offer breathtaking views of the flowering fields and meadows. The route is very convenient to pass — this will help you a lot of stairs. On the way, the pass Pshiaskho will meet, which will amaze with the beauty of the opening species. 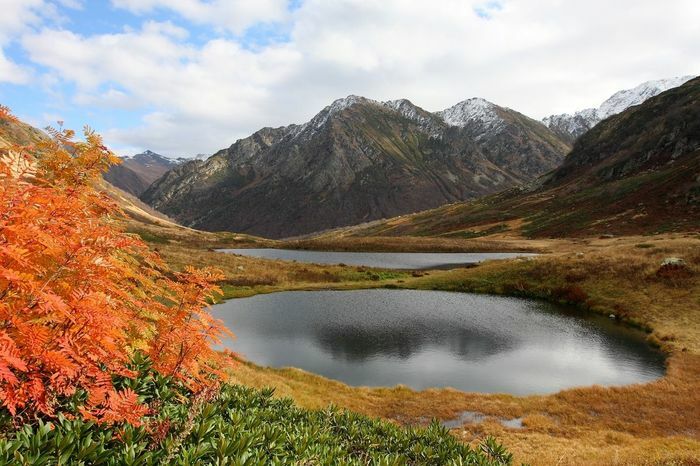 You will conquer the mountain peak Dzitaku, whose height is more than two thousand meters, walk along the canyons and be able to look at the beautiful lakes. Vivid photos and unforgettable emotions from the sights are guaranteed! This beautiful historical complex is located near the famous Rosa Khutor place in Sochi. You will be pleased with the surrounding area: beautiful views of nature, mountain peaks, canyons and water bodies. The complex is an architectural structure reminiscent of different cities and regions of Russia: Moscow, St. Petersburg, Novgorod, Krasnodar, the Urals, Sochi. Unique objects made by skilled craftsmen will amaze your imagination. The My Russia Center is an excellent attraction that you can visit and see at any time of the year. In the summer you can admire the mini-copies of buildings, take a walk, learn a lot of interesting things about your country. Winter in “My Russia” turns into native Russian — fascinating fun, riding on the snowstorm, playing snowballs and traditional pancake tea await you. Also next to the object is an icon-painting workshop, where you can come to listen to prayers. On the way, you can buy souvenirs from different regions, as well as sample national cuisine. Famous dolmens — this is something that is worth a visit to Krasnaya Polyana. The group of objects resembles the form of the Egyptian pyramids. Admire the local attractions can be in the village Medvedevka, on the outskirts of Sochi, in the village of Chvizhepsse, near the ski resort. Hmelevsky lakes represent a large complex of water bodies. Here you can relax both soul and body, in the winter time to ski or snowboard, admire the picturesque landscapes. In the summer, it will be possible to visit amazing ponds in these places. Next to them are viewing platforms, where you can spend time in thought and observation. But if you prefer a more active vacation, collect a backpack and go hiking. On the way, you can visit the unique waterfalls, weather station, look at the opening views. For lovers of extreme sports there is a jeeping. The Khmelevsky complex is distinguished by a wide variety of flora and fauna — you can meet squirrels, bats, roe deer and wild boars while walking around the neighborhood. If you are lucky, you will see bears, wolves or foxes, who also often walk not far from the natural complex. 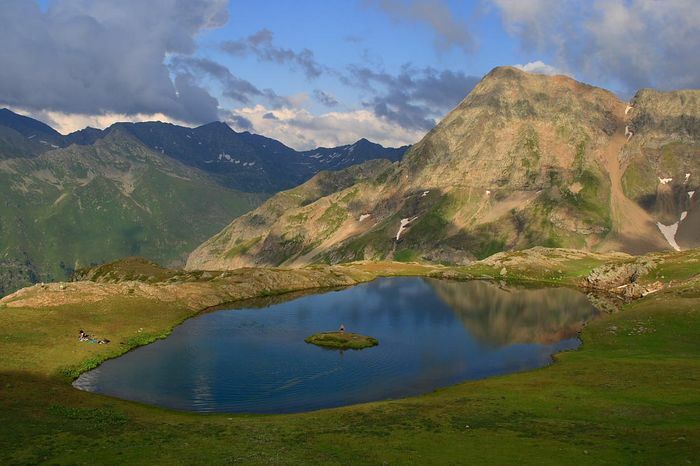 Luxurious nature and rich fauna are the main features of the Caucasus. In the captive complex, you can see with your own eyes the rare species of animals listed in the Red Book: roe deer, bison, deer, white-tailed eagles and others. The zoo is also used as a charity complex — wounded or sick animals are cared for here. What to visit in Krasnaya Polyana in the winter? From this peak there are magnificent views. Fresh air, a feeling of weightlessness — it seems that now you will touch the clouds. The mountain range is located near Sochi Park. Aigba is especially good in winter when she is covered with a snow-white blanket. Take advantage of the unique opportunity to ride a ski or snowboard. The famous Olympic Village is located in the complex “Rose Farm”, near the city of Sochi. This is a year-round resort, you can relax here both in winter and in summer. In the cold season, an unusually warm welcome awaits you. At your disposal more than 500 houses and cottages of unusual shape, reminiscent of alpine «chalets». You can look at a famous place by ordering a special tour. Are you an active lifestyle lover? Then this option is for you. 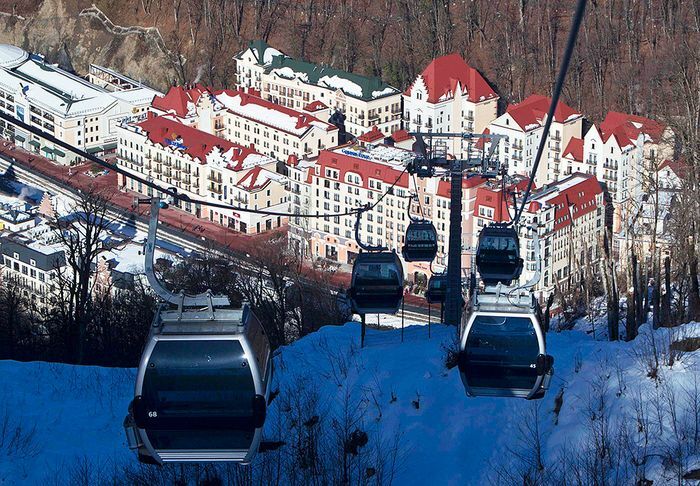 At the world-class ski resort Rosa Khutor you can go skiing, snowboarding, cycling. At your disposal are many tracks of various levels of complexity, designed by high-class sports experts. You can also climb to the top of the mountain by cable car. Before you open the beautiful winter landscapes. Reasonable prices, new acquaintances and interesting sights — you see, it definitely deserves attention. The unique shape of the ice palace makes it a unique and original object. It resembles an elongated drop. It was here in 2014 that the opening and closing of the Olympics in Sochi was held. Today, various events and concerts are initiated in the palace, and athletes are trained. The object accommodates more than 10 thousand people. The house of the famous Estonian literary critic Anton Tammsaare, converted into a museum, is striking in its originality. Originally a classic came here to improve his health. Now the museum holds unique exhibits in the form of old-fashioned clothing, books and household items that remind you of the peculiarities of the life of the Estonian people. You can admire this magnificence on Estonian Street, 35 every day from 10 am to 17 pm. The Krasnaya Polyana Winter Sports Palace is a unique landmark. «Iceberg» is a universal object, which in an emergency can be transported from place to place. The creators conceived creative outlines, reminiscent of the trajectory of movements of skaters. The stadium of the palace accommodates more than 10 thousand people. During the Olympics in Sochi there were competitions in short track and figure skating.